Visual schedules are more intuitive and allow you to see who’s “on-call” and that you have “coverage” the entire time. The calendar can inform and remind your staff WHO is on-call/duty at any time. Overcome the limitations of the “time-based chain” which can’t currently do “overnight” shifts like “6pm to 8am the next morning” and rotations that change each week or on a specified date. UPDATE! If you’re using Office365, please use a new version that doesn’t require Cronofy (June 2018). This is a datasource (PowerShell script) that reads your calendar every ~5 minutes and verifies or changes your LogicMonitor Escalation chain(s) to match the calendar. It uses free ‘middleware’ called Cronofy so one script can support 4 different calendar vendors (i.e. google, Microsoft Office 365, etc). If I see enough demand for a single type of calendar, I could write directly to that without using Cronofy. FYI: This datasource has been updated from our older RPC API to newer REST API. The event names on your calendar must specify usernames in the event name e.g. 1=Al (SMS), 2=Bob (voice). Email is the default so you don’t need to specify that in parenthesis. 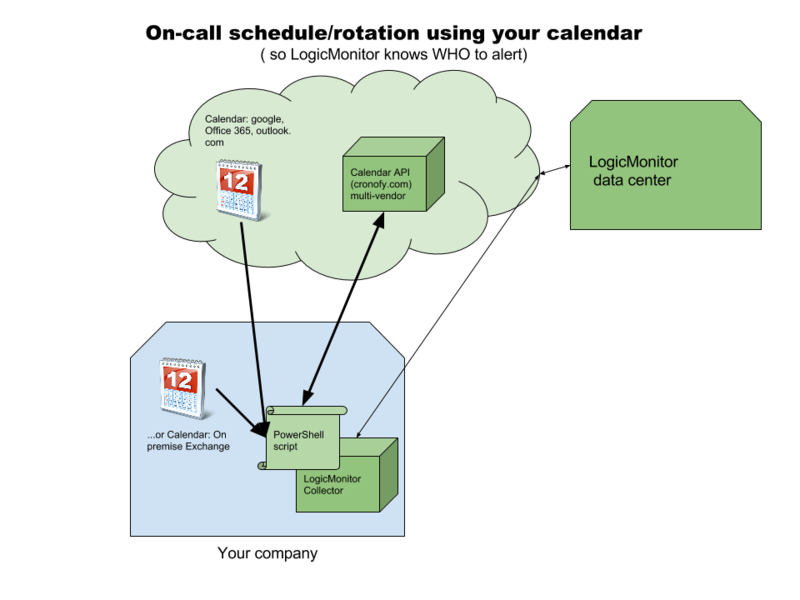 I suggest you create a user account in LogicMonitor for the API calls. Generate the API ID and key and save them. Set a property for ‘api.key’ at the device or group or account level. If you haven’t already, create your schedules. 5=For some unknown reason, after the script changed the chain (HHHH) ; the chain doesn’t match the event. [20160316 04:32:51]-REST status: 200, 5 total escalation chains found for suding account. [20160316 04:32:51]-2 escalation chains found that contain 'schedule'. [20160316 04:32:52]-2 calendars found that contain 'schedule'. [20160316 04:32:53]-Processing calendar 'Network on-call schedule'. [20160316 04:32:53]-Processing calendar 'Database on-call schedule'. [20160316 04:32:53]-66 on call events found in 2 calendars. [20160316 04:32:53]-Current Date is Wednesday, March 16, 2016 11:32:53 AM UTC. [20160316 04:32:53]-The current event is evt_external_56e4380773767685b80808d4 - start 2016-03-16T00:00:00Z UTC, end 2016-03-16T15:00:00Z UTC, summary: 1=Bob (sms) 2=Cole. [20160316 04:32:53]-The current event is evt_external_56e6f90a73767685b80b3050 - start 2016-03-15T23:00:00Z UTC, end 2016-03-16T16:00:00Z UTC, summary: Al (voice). [20160316 04:32:54]-Updating LM escalation chain. [20160316 04:32:56]-Update successful, REST status 200. [20160316 04:32:56]-No update to LM escalation chain required.